The ‘LT’ tag on the Ghost stands for long travel. 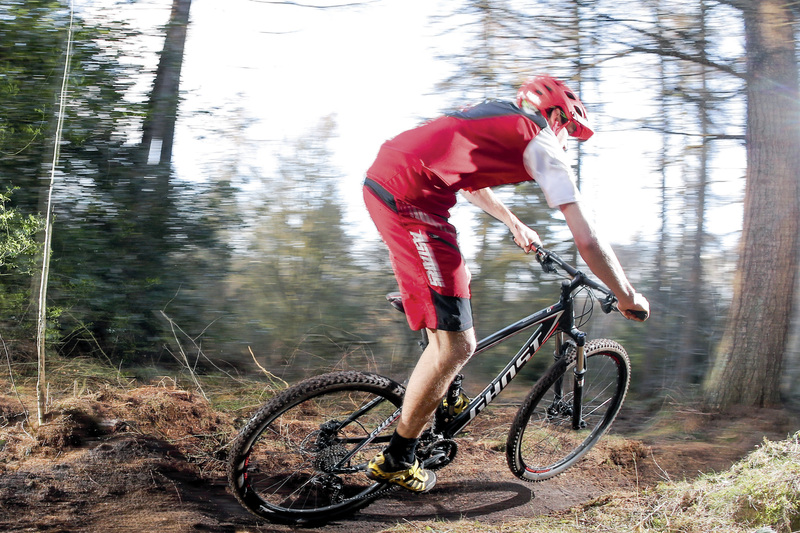 But this 29er trail bike only has 120mm on the rear and a 130mm fork, so what gives? Basically, it’s a ‘long-travel’ version of the more XC race-orientated, 100mm- travel, AMR model. It’s the cheapest bike in the MAR LT range but it shares the same alloy frame with its more expensive siblings and even retains the 142x12mm rear end to boost frame stiffness. And while it’s obviously an entry-level bike, with its curved down tube and finely tuned four-bar suspension design, it’s still a Ghost through-and-through. The RockShox Sektor fork is a great choice on a £1,500 bike. Pumping out 130mm of travel, the smooth steel upper tubes ensure good sensitivity while the 15mm Maxle lowers provide better stiffness and steering precision. There’s also an effective lockout lever to make the fork rigid for climbing. Controlling the 120mm rear travel is a well-tuned X-Fusion 02RL shock with a bearing in the upper eyelet for extra sensitivity. The shock has rebound adjustment and a lockout lever (that’s very stiff to move) to match the adjustments on the fork and firms things up for any extended fire-road climbs or tarmac hacks. Top marks to Ghost for getting the essentials of suspension and brakes sorted at this modest price point. One look at the peppered paint on the chainstay however and it’s clear that the Ghost would benefit from a clutch-style rear mech to rein-in chain slap. So, nice as it is getting a top-level XT mech, we’d have much preferred one of Shimano’s chain-stabilising Shadow + mechs, even if it meant dropping down a tier or two in the spec hierarchy. By far the weakest link in the components is the wheelset. Not only are the wheels flexy, the cones on the Shimano Deore front hub kept coming loose, making the bike feel and sound like a bag of spanners. They’re heavy too, and don’t accelerate with any zip; even with the semi-slick Schwalbe Rocket Ron tyres fitted. Mix in some moisture, which is pretty hard to avoid at this time of year, and the tyres lacked traction and control on anything other than armoured or rocky trails. 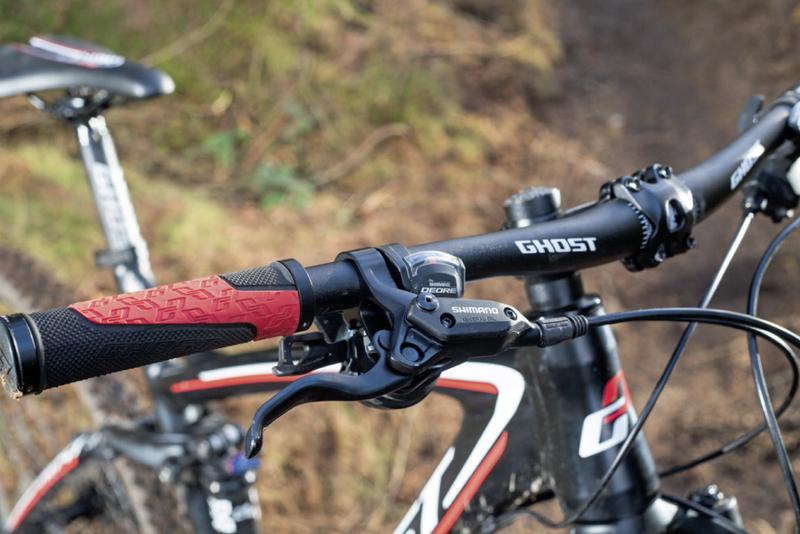 The combination of the super-sensitive rear suspension, 130mm travel Sektor fork and the big ol’ 29er wheels means the Ghost can truck-on through rough, rocky terrain without ever getting out of shape. Factor in the extra pedal clearance afforded by the lofty BB and the Ghost was best at bashing up or down lumpy bridleways. 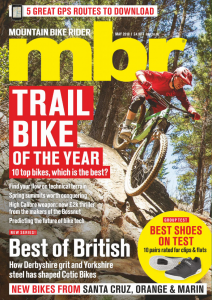 On less one-dimensional trails, such as the fast, flowing singletrack typical of most British trail centres, the Ghost never felt as lively as we’d have liked. Yes it pedals efficiently, and is neutral under power, but with the weight of the bike approaching 32lb it was hard going when accelerating out of corners or sprinting up short, sharp climbs. 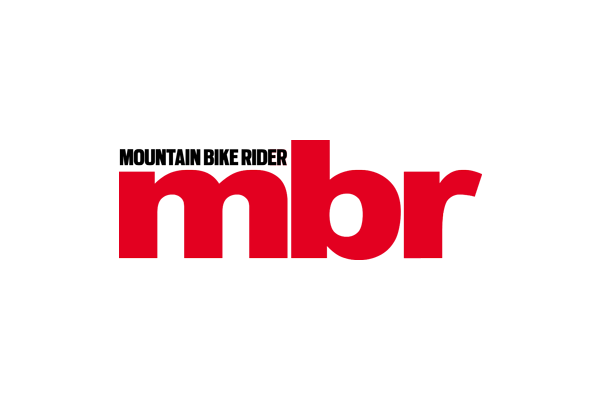 There are also the flexy wheels, overly long stem and somewhat upright riding position to contend with when the trail requires more rider input than simply leaning back and holding on though gritted teeth. As such we were always left wanting something more from the Ghost on the most exciting sections of trail. 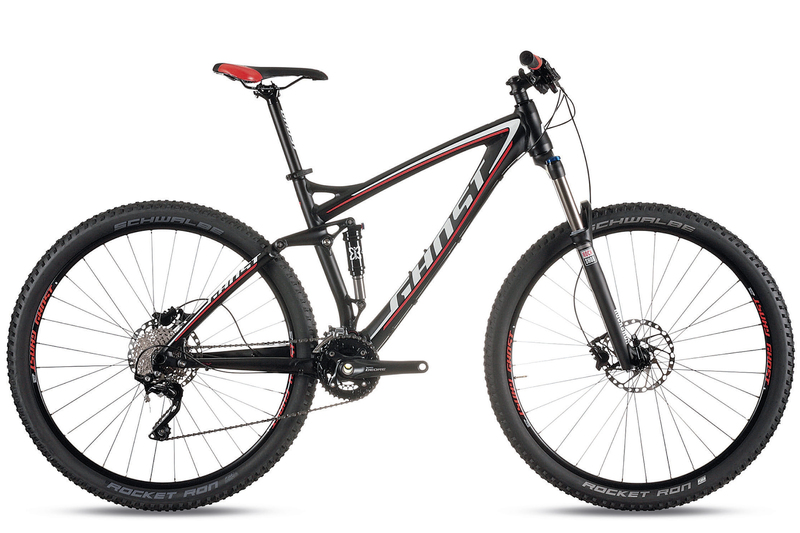 The best 29er trail bikes offer a great feeling of stability and security by placing your feet well below the axle centres. This gives you the sensation of being sat ‘in’ rather than ‘on’ the bike. Not so on the LT.
With a lofty 346mm BB you feel more perched on the bike than the others in test. And compared to the tuned, taut chassis of the Specialized Camber, the Ghost felt a little flat and rode too much like an out-and-out XC bike, only without the turbo-boost capability of their super-light ilk. Also, after just one month of testing it started to look and feel abused, which doesn’t bode well for long-term durability. Ghost doesn’t get too much wrong in any single department on the AMR LT 2 and, typical of the German brand, the suspension is supple and sorted. The 29er wheels and XC geometry make it a comfortable and capable mile-muncher, but overall the bike doesn’t add up to more than the sum of its parts. 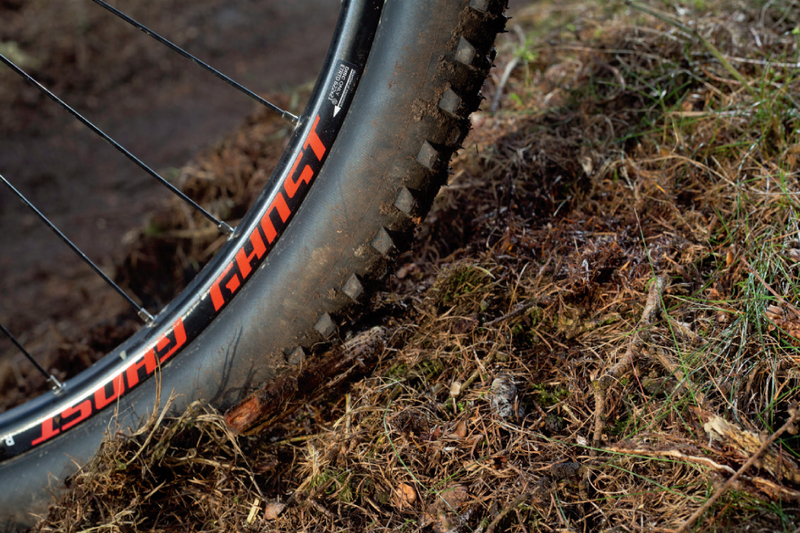 The result is a bike that’s lacking in excitement and urgency, and, at almost two pounds heavier than the others on test, the Ghost AMR LT2 is simply too chunky to rip around the sweetest trails; either for fitness addicts or wannabe shredders.